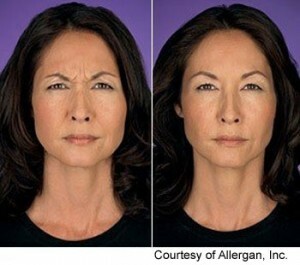 Do you have frown lines that make you look angry even when you’re not? Many of my patients tell me that they’ve thought about anti-wrinkle injections to smooth out their wrinkles, but are afraid to look stiff and unnatural. The fact is that you can look naturally relaxed with injections but only if it’s done correctly, and that takes years of experience. I’ve treated patients with anti-wrinkle injections in London since 2006, and I’ve taught other doctors how to use it correctly. Even so, I continue to refine my technique to give my patients the best results—as gently and painlessly as possible. What are anti-wrinkle injections, and how does it work? Anti-wrinkle injections use a purified protein that works by relaxing overactive, wrinkle-causing muscles. With less movement, the skin surface smoothes out. If the wrinkles have been there a long time (years) and are very deep, it may take time for them to smooth out. Newer wrinkles may look smoother within days after being treated. In addition, the treatment prevents the wrinkles from getting deeper, by relaxing the muscles and preventing the skin from getting creased more deeply. What areas can be treated with Anti-wrinkle injections? crow’s feet, around the eyes. What is it like to get an anti-wrinkle injection? I start each treatment by carefully evaluating your face and how your muscles move. We’ll discuss what result you’re looking for, since each person’s facial structure is unique. Then I use a very fine needle to inject tiny doses of solution into the wrinkle-causing muscles. I often use an ice pack on the area before injecting: this reduces discomfort and the risk of bleeding or bruising. Sometimes I apply a numbing cream, especially in sensitive areas. Many first-time patients are surprised by how quick (about 10-15 minutes) and relatively painless the treatment is. How many injections will there be? Each patient is different, and my secret to giving you a natural-looking result is to design the treatment that will work best for you. Your best friend may need 8 injections on her forehead, while you might get the best results with only 4. In addition, you might need a combination of injections and Dermal Fillers to get the results you’re looking for. What do I need to do after my anti-wrinkle Injections? You may resume normal activity right after your treatment. The treated areas may be slightly pink and raised for an hour or so, until the liquid is absorbed. Many people go back to the office with just a little powder to hide any pinkness. Most importantly, I tell my patients to not rub or massage the area and not to lie down for 4 hours after treatment to avoid pushing the product away from where I precisely placed it. Most people start to see results within a few days(4-7 days), and it may take a week or two to see the full effect of the treatment. If your wrinkles are deeply creased (if they’ve been there for years), they won’t suddenly disappear; however, you’ll likely notice that your skin will keep looking better and better, as long as you maintain your treatments. Treatments last an average of 4 months, although this depends on what area is treated and how much is used. Some of my patients notice that their treatments last longer over time, as their muscles are ‘trained’ to not scrunch so hard. Anti-wrinkle injections are a safe and effective treatment for excessive perspiration (sweaty underams, palms, and soles). This is called hyperhydrosis. It’s been life-changing for many of my patients who have suffered from extreme perspiration that’s unresponsive to antiperspirants. The result lasts up to 1 year or longer in some patients. What about injections for migraines? Anti-wrinkle injections are also a very effective treatment for migraines that are resistant to many types of painkillers. It’s been life-changing for my patients and can lasts for several months. Prices start from £365 for 3 areas.